Recent government studies have indicated that American teens rampantly abuse both illicit and pharmaceutical drugs. While many young people simply experiment with drugs, about 8% of them develop an addiction. Once teen drug addiction takes root, your child is at a higher risk for social problems, early death and a litany of other serious issues. Marijuana — This drug, which is known for providing a relaxing high to users, has undergone significant changes in its consumption methods. 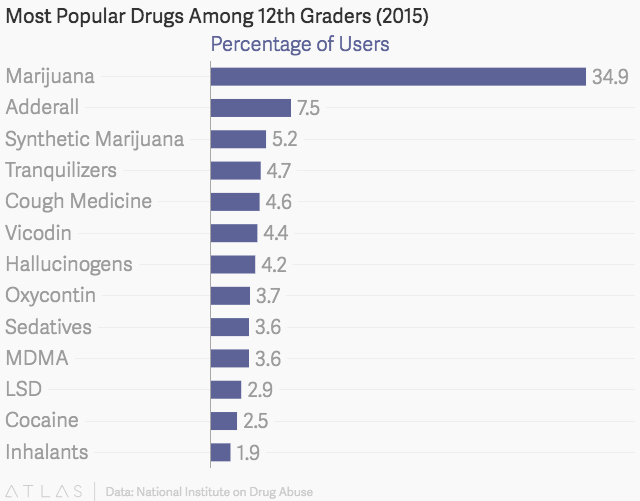 Today, teens use marijuana not only by smoking it but also through edibles, pills and vaporizers; 34.9% of high school seniors use this drug at least once per year. Adderall — This stimulant is prescribed for ADHD patients, providing sharper focus and heightened attention levels. Teen Adderall abuse is popular in high schools and college campuses because of the belief that the drug can give a necessary boost in school; 7.5% of high school seniors use this drug at least once per year. Synthetic Marijuana — Also known as “spice” or “K2,” synthetic marijuana does not contain THC (the active ingredient in marijuana) but produces relaxing, euphoric effects similar to those of traditional marijuana. It can also induce psychotic episodes that plague users with extreme anxiety, paranoia and confusion; 5.2% of high school seniors use this drug at least once per year. Cough Medicine – Many of these over-the-counter and prescription medicines contain the narcotic painkiller codeine. Teens can achieve a codeine high by overdosing on Robitussin, colloquially referred to as robotripping; 4.1% of high school seniors use this drug at least once per year. Vicodin — This powerful and highly addictive painkiller is often prescribed to hospital patients who have just undergone surgery. Teens who do not medically require Vicodin abuse it because it causes a brief euphoric high accompanied by cloudy thinking and lethargy; 4.4% of high school seniors use this drug at least once per year. Hallucinogens — These drugs cause users to experience visualizations of things that do not really exist. Psilocybin mushrooms (or “magic mushrooms”), salvia and LSD are popular choices among teenagers, since they enable users to “trip”; 4.2% of high school seniors use this drug at least once per year. MDMA — Also known as “molly,” this drug induces extreme euphoria, followed by depression, as amounts of the brain chemical serotonin spike then sharply decrease. Molly is ubiquitous at music festivals and concerts; 3.6% of high school seniors use this drug at least once per year. Cocaine — This popular club drug has been around for decades, and doesn’t appear to be going anywhere. Teenage cocaine use is widespread because the drug temporarily increases energy and lowers inhibitions, which allows teens to party and stay alert for longer; 2.5% of high school seniors use this drug at least once per year. Florida’s miles of coastline and busy ports make the state a hotspot for imported items, including new drugs. In 2015, flakka — a synthetic crystal from China — ravaged South Florida, causing hundreds of hospitalizations and 60 deaths. The dangers of flakka use — which can be snorted or injected — include leaving users with extreme paranoia and hallucinations. “Study drugs” such as Adderall have quickly crept onto school campuses all over the country. These stimulants — which offer extended attention spans and sharpened focus — are growing in popularity and are now used by over 7% of high schoolers. Tranquilizers like ketamine have long been used in veterinary medicine, as it causes sleepiness and can help make medical procedures more tolerable. However, in recent years, ketamine abuse has increased in popularity because of its capacity to induce dissociation and help users “zone out.” Though just a little under 2% of high school seniors used ketamine in 2015, the drug’s popularity has increased from previous years. Although teen drug use occurs at epidemic proportions, the most common substance abused by teenagers is alcohol. In fact, researchers found that 35.3% of 12th grade students had used alcohol in the past month — 58.2% have drank in the past year. In fact, 35% of teens have tried drinking by age 15 and 65% have tried alcohol by age 18. Youth aged 12–20 are responsible for 11% the U.S.’s alcohol consumption. Teen alcohol abuse is rampant because teens can acquire alcohol relatively easily — since many parents keep it in their homes. This substance allows teens to let their guards down and engage with peers more comfortably. However, the perceived benefits of alcohol are mitigated by its dangers. Almost 5,000 young people under age 21 die each year from alcohol-related incidents such as overdose and car accidents. Peer Pressure – Teens are quite vulnerable to copying the behaviors of those around them. For example, if your child’s friends are “robotripping,” then your teen is more likely to try the same method of drug abuse. Social Boost – Drugs that give you confidence tend to appeal especially to shy teenagers who otherwise feel socially inept. Academic Problems – Struggles at school can have a huge impact on a child. If academic pressure, your teen might feel they have no choice but to abuse a “study drug” such as Adderall. Parent Behavior – If you or another adult in your home abuses drugs or alcohol, then your child has received the message that this behavior is acceptable. Boredom – If your teen is disengaged in life, they might seek excitement through a new experience such as drug use. Simple as it may sound, substance abuse offers an activity to pass the time. Co-Occurring Disorders – Oftentimes a teen who is dealing with depression or anxiety will turn to substance abuse as a way to cope with their mental problem. From decreased academic performance to social isolation to serious physical injuries, drugs and alcohol can impact your teen in countless ways. While some of these effects can be remedied when the substance abuse stops, many are permanent. Each drug carries its own set of side effects, but some consequences are prevalent among multiple substances. Just as the effects of drugs vary from substance to substance, as do the signs of drug abuse. However, there are a few commonly exhibited signs and symptoms of teen drug abuse. Bear in mind that some of these symptoms — such as moodiness and lethargy — are natural parts of adolescence. Pay special attention to these when they are combined with other symptoms on this list. The National Survey on Drug Use and Health found that less than 10% of addicted American teens actually enrolled in one of the country’s many drug and alcohol treatment centers. When addiction is not treated during adolescence and allowed to continue into adulthood, risks of serious health problems and death increase. Stop drug use before it requires treatment for teenage drug addiction. Openness is the key. Talk to your teenager non-judgmentally about drug use, ask them questions, and be open to their opinions. Let them know that substance abuse is not permitted in your home, and establish consequences for such behavior. Most importantly, express that your teen’s well-being is the reason you are making rules against substance abuse. You want your teen to grow up to be a healthy, vibrant adult and drug abuse can severely hinder their development. If your teen’s substance abuse problem has gotten out of control, you have several options. There are several different approaches to rehabilitation and treatment for teenage drug abuse. Since the way to recovery is unique for everyone, it’s important to discuss your family’s situation with a treatment professional who can guide you in your decision. If your teen has already been to a treatment center and your primary concern is now relapse prevention, then a meeting-based program may be suitable. These programs often link each participant to a sponsor who provides accountability and support. However, 12-step programs are limited in that they do not provide the level of support that many addicted teens need. Addiction is powerful, and sometimes getting help via an inpatient treatment center is the best way to fight it. Oftentimes, the recommendation is for inpatient drug rehab for teenagers — especially when the problem has existed for a long time, other avenues have proven unsuccessful, or the addiction has grown so entrenched that your teen’s daily life is significantly impacted. Outpatient drug rehab can offer daily support without the commitment of residency. If your teen does not require constant supervision and can manage a daily commute, then this style of rehab may fit your family’s needs. Like 12-step programs, outpatient programs can be helpful but do not provide the support of inpatient rehab. If you believe your teen is abusing drugs or alcohol, our team at Next Generation Village may be the answer. We can help assess what kind of help your child will need and guide your family with options through this process. Location and treatment expertise can be powerful contributing factors in teen drug rehab success rate. At Next Generation Village, your child will have the best of both worlds. The serenity and calm of drug rehab in Florida may provide the right setting for kickstarting recovery. Coupled with the understanding care of our team, your child will have all the tools they need to get better. Get in touch with us today and find out how drug treatment in Florida can help your teen’s addiction recovery.